Cook the pasta according to the directions on the package, adding a generous tablespoon or so of kosher salt to the water as it cooks. Just before the noodles are done cooking, add the broccoli to the pot. Let the broccoli boil for about 30 seconds and then drain everything into a large colander. Rinse well with cold water. Stir together the mayonnaise, vinegar, salt, pepper, and sugar in a large mixing bowl. Add the cooked pasta and broccoli to the bowl and stir well to coat. Add the cucumber, pepper, and onions and stir again. Taste and adjust seasonings, if needed. Cover and refrigerate until ready to serve. Stir again just before serving. Enjoy! If you forget to toss the broccoli in the boiling water at the end of the pasta’s cooking time, you can also steam it in the microwave. Place the broccoli in a glass bowl along with a tablespoon of water. Microwave for 60-90 seconds, until the broccoli is bright green and barely softened. 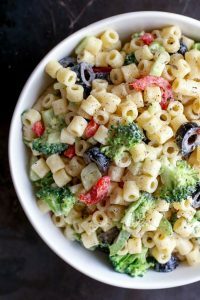 This entry was posted in pasta, recipes, salad, salad dressing and tagged black olives, broccoli, cuccumber, pasta, red pepper, salads, scallions, sugar, vinegar by admin. Bookmark the permalink.